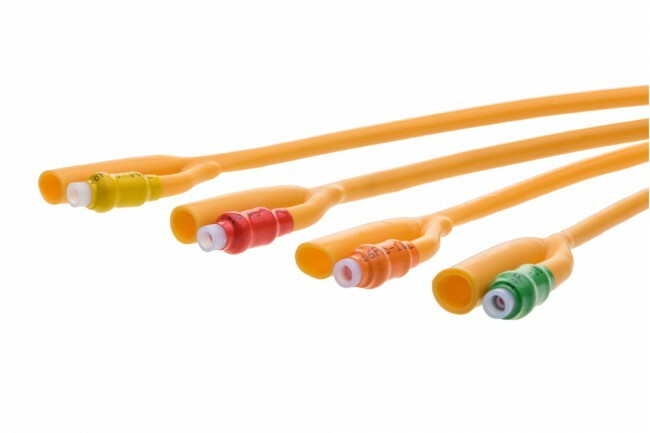 A Foley catheter is a thin, sterile tube inserted into the bladder to drain urine. Because it can be left in place in the bladder for a period of time, it is also called an indwelling catheter. It is held in place with a balloon at the end, which is filled with sterile water to prevent the catheter from being removed from the bladder. The urine drains through the catheter tube into a bag, which is emptied when full. The procedure to insert a catheter is called catheterization. Packaging: 10 pcs per box. 2) Fully siliconized smooth surface for atraumatic catheterization. 3) Polymer coating inside surface for greater inner diameter and high flow. 4) Smooth eye and ultra-thin highly elastic balloon and hard non-return valve for trouble free deflation and inflation mechanism. 5) Sterilized by EtO Sterilization. 6) Sterility guaranteed unless package damaged or opened. 7) Individual packaging in paper/film pouch bag. 8) 5 years of expiry shelf life.